Tuareg shield lies to the Pan-African domain that has recorded a complex orogenic evolution during the upper Neoproterozoic. It is bordered to the west by the West African craton (WAC) stable since 2 Ga and to the east by the East Saharan Metacraton. Referring to Previous works this shield recorded two main punching phases; an early collisional phase within the west with the WAC through mega N–S shear zone and last one to the East with the eastern Saharan metacraton. 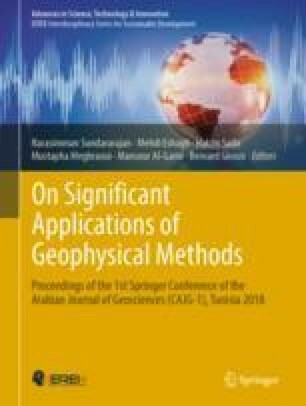 The main purpose of this work was to bring new geological and interpreted geophysical data by using remote sensing, airborne geophysics and fieldwork to produce an updated geological map. Moreover, it extracted tectonic features that encompass the kinematics evolution of N–S shear zones border of the Tefedest terrane that is part of central Hoggar. The integration of remote sensing data processing as well as airborne geophysics (Magnetic and Gamma ray spectrometry) data led to develop a 1/200,000 scale geological map. The extracted tectonic features (foliation, lineaments and main shear) through various processing techniques led to set chronological deformation steps as E–W foliation was relics of oldest deformation phases and D2 is N–S tight fold phase, while D3 was merely a brittle wrench feature. The Tefedest evolution was transpressive and slides through the main shear border led their squeezing toward north during Pan-African orogeny.